"It's too late. I'm too old. It's too humiliating, and I don't need it." Martin Davidson directed 1983's Eddie And The Cruisers, which was the remarkably dull story of the search for a mysterious and enigmatic rock star from the 1960s. Despite the fact that all of the era music sounded like rehashed Bruce Springsteen, the film still managed to find an audience who got wrapped up in the appeal of what was supposed to pass for rock and roll's seamy underbelly, and the vague Jim Morrison-ish mythology that was tossed into the mix. I never understood the attraction of Eddie And The Cruisers, but I was apparently in the minority. With Looking For an Echo, Davidson once again centers a story around the world of music, only this time he examines the mid-life crisis of an aging doo-wop star. In working class Brooklyn, Vinnie Pirelli (Armand Assante) is about to turn 50, and his salad days as the teenaged lead singer for the chart-topping doo-woppers Vinnie And The Dreamers way back in 1964 seem like a distant memory. He's a widower with three kids, and barely makes ends meet by bartending and playing keyboards in a tacky wedding band. His youngest child, teenager Tina (Christy Carlson Romano), is bed-ridden in a hospital, battling some type of cancer, while his middle son, Anthony (Edoardo Ballerini) is trying to make it as a musician himself. His association with eldest son Tommie (David Vadim), a Brooklyn cop, is glossed over, almost like an afterthought put in place only for a hot-tempered family feud near the film's conclusion, with the core of Looking For an Echo centering on the lives of Vinnie, Anthony and Tina. Vinnie develops a whirlwind romance with Tina's nurse Joanne (Diane Venora), who is one of those brassy but loveable Brooklyn caricatures we've all seen a million times before. The interaction between Assante and Venora never seems forced, though it does seem to move along rather quickly, and at times the presence of cancer-ridden Tina (the perkiest, cutest sick kid I've seen) seems like nothing more than a manipulative plot device that can be conveniently overlooked when needed. The two have a touching moment together when Vinnie explains the inspiration for The Dreamers hit song This I Swear, and the next scene finds them listening to Anthony perform the song, and the song delivers a solid dramatic punch. This is the story of a man who had fame and success, and eventually lost it all, except for his memories, and even those are painful. Vinnie's seemingly complacent exterior ultimately crumbles, as his real emotions are revealed in a well-written scene at the film's midpoint where the reunited Vinnie And The Dreamers discuss their post-fame lives in an Atlantic City hotel room. Davidson comfortably mixes a handful of genres here, by merging a love story, a traditional family drama and a mid-life crisis saga within the framework of Looking For an Echo, with Vinnie's past musical stardom acting as the glue that links everything and everyone together. The musical performances, especially Anthony's version of This I Swear, are well done, and are presented in a very natural manner. It's a nicely told story, that works pretty hard to yank the heart strings. Image Transfer Review: A respectable transfer, presented in a 1.33:1 aspect ratio. The lack of a widescreen format doesn't hurt a film like this, because it plays like a television movie and the 4:3 never made me feel like I was missing anything. Colors look consistent and natural, though fleshtones sometimes come across with too much of a golden hue. This is a very clean print, with no noticeable grain or blemishes. Audio Transfer Review: The above average 2.0 surround mix come through when it needs to, during the musical portions of the film. I was pleased (and admittedly surprised) at how full the music sounded, though the dialogue, clear as it was, never seemed as significant. A few subtle surround cues (especially during Anthony's concert sequence) prove that a 2.0 mix can provide the necessary ambiance when needed. Extras Review: Not much here, other than a theatrical trailer and some bios of the principal cast. 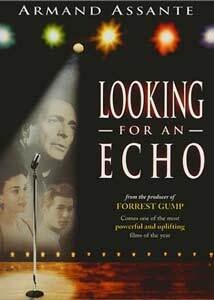 Looking For an Echo would probably be classified under the "feel good" genre of films, and that should tell you what you need to know; in fact the DVD cover uses a blurb that calls it "powerful and uplifting." The music, a key element here, never seems forced or out of place, and the sometimes sappy story, while maybe not completely original, is performed appealingly by the cast.